“We say to our Republicans that want to privatize Medicare: ‘Go try it. 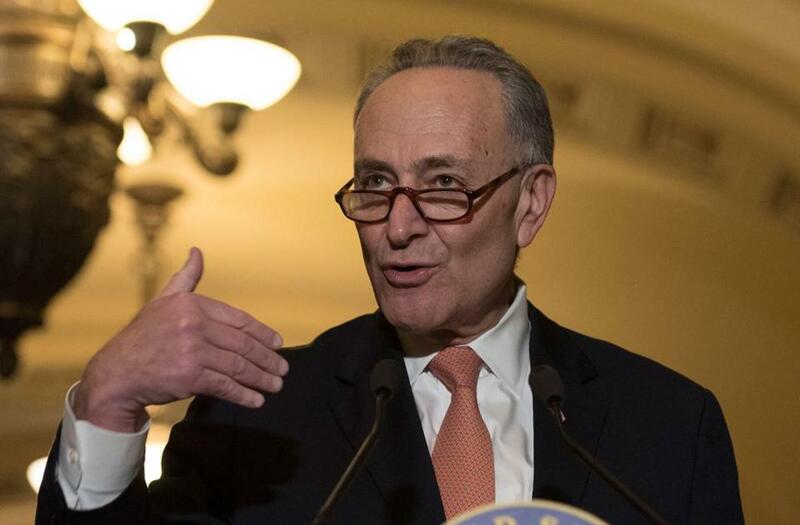 Make our day,’ ” said Senator Chuck Schumer, a New York Democrat. WASHINGTON — Within days of Donald Trump’s election, left-leaning donors were asking Erica Payne: What’s the plan for Granny? Payne’s group, the liberal Agenda Project, produced a sequel when former Massachusetts governor Mitt Romney picked Ryan to be his presidential running mate in 2012. “Throwing Granny off the cliff” became part of the vocabulary of the Medicare reform fight. Now, a new fight over the popular entitlement program is shaping up to be an early battle between Democrats on one side and Trump and the Republicans on the other. Battered Democrats and their allies, in need of political reinvigoration after Trump and Republicans stunned them in last month’s elections, are readying their powerful, emotional lobbying efforts to stave off changes in Medicare. Advocacy groups including AARP, the powerful seniors lobby with close to 38 million members, are pulling out battle-tested weapons and drawing up plans of attack. A key part of the strategy will be using Trump’s own promises from the campaign trail to not cut Medicare, Social Security, or Medicaid, the federal health insurance program for the poor. The push to curb Medicare costs is driven mostly by Ryan and the House, and Trump is not on board in any specific way. Ryan’s plan would transform Medicare into a subsidy program — called “premium support’’ — in which seniors would get a fixed amount of money from the government to shop for health insurance from private companies. Ryan says such a move is required to make sure Medicare remains solvent for future generations. But that means tampering with a safety net program that Americans have counted on since it was adopted as part of Lyndon Johnson’s Great Society 50 years ago. For years, Democrats have used their protection of Medicare as a potent political weapon against Republicans who want to cut or slow the increase in spending on the popular program. They’re wasting little time as the Republican majorities — now with a GOP president about to take office — discuss changes in Medicare. On Wednesday, he will appear with House Democratic leader Nancy Pelosi of California, Senator Bernie Sanders, and other lawmakers at a “Hands Off Medicare” press conference. The event will feature seniors and Medicare activists delivering 1 million signed petitions telling Trump, Ryan, and Senate majority leader Mitch McConnell of Kentucky to “keep their hands off the American people’s earned Medicare benefits,” event organizers said. Expected to win a second term as House speaker, Ryan set off alarm bells among Medicare supporters in the days following Trump’s White House victory. In a Fox News interview, Ryan said that Republican efforts to repeal and replace the Affordable Care Act — a top priority once Trump is in office — would also have to involve changes to Medicare because the two health programs are intertwined. “Medicare has got some serious problems because of Obamacare. Those things are part of our plan to replace Obamacare,” Ryan said. Trump’s nomination of Representative Tom Price to head the Department of Health and Human Services was another red flag for Medicare advocates. Price is an enthusiastic supporter of previous plans to privatize Medicare; he, too, said shortly after the election that Republicans need to use their new power to restructure Medicare and other entitlement programs. It is unclear what Trump himself wants to do. Trump’s transition website includes language saying his administration will act to “modernize” Medicare, which advocates of the program say is code language adopted by Ryan and his ilk for privatization. Trump’s transition team did not return a request for comment. Ryan’s makeover would curb the current Medicare system under which Medicare directly pays doctors and hospitals a set fee for the services beneficiaries receive. Under his plan, poorer and sicker people would get somewhat more “premium support.’’ Ryan also would gradually raise the eligibility age for Medicare from 65 to 67. The overhaul would be aimed at future beneficiaries. Under a phased-in approach, Americans aged 55 or older at the time of its adoption would see “no changes,’’ Ryan has said. Ryan accused Democrats last week of engaging in “Mediscare politics — which they typically do every other Tuesday,” and said he hadn’t discussed Medicare with Trump. “Medicare itself is on a path to going bankrupt. . . . We are going to have to do things to preserve and shore up this program,” he said. Ryan’s opponents question claims that competition among private insurers would lead to lower costs. The only way Ryan’s plan would save money would be from capping the payment the government gives to seniors to help them pay for the premiums “to the point seniors are going to be paying a lot more for less,” said Dan Adcock, policy director for the National Committee to Preserve Social Security and Medicare. The issue is potent outside the Beltway, making it a danger to Republicans hoping to hold their majorities in both chambers of Congress in the 2018 midterm elections. On AARP’s Facebook page, worried members started attaching queries about Medicare’s future on posts about preventing diabetes and Thanksgiving travel plans in the days after the election. It urged members to send a prewritten message to Trump about keeping his campaign promises to protect Medicare. More than 150,000 people responded within hours of the alert going out. “Obviously, this is an issue that struck a nerve among our membership,” said David Certner, AARP’s legislative counsel. The National Committee to Preserve Social Security and Medicare says its new member enrollment for November jumped about 400 percent over a typical month because of anxiety about GOP plans for Medicare and other entitlement programs, and donations to the group are up as well. Adcock, the group’s policy director, said a big part of the group’s work going forward will be educating lawmakers, particularly in the Senate, who may not have been as engaged with the issue when it was being pushed by House Republicans in budget bills that, with a Democrat in the White House, had no chance of becoming law. “Now, we’re in a situation where they’re actually legislating, and so members of Congress are going to need to be much more serious about this,” he said.